We’d love your help. Let us know what’s wrong with this preview of The Soterion Mission by Stewart Ross. First published in 2011 as a serialised ebook by Fiction Express. In a post-apocalyptic world where no-one lives beyond their teenage years, the mysterious Roxanne arrives in Cyrus’s village, fleeing the barbaric Zeds. She claims to be on a mission that can save them all, but can she be trusted? Cyrus joins her in her q First published in 2011 as a serialised ebook by Fiction Express. To ask other readers questions about The Soterion Mission, please sign up. I think that The Soterion Mission is a book that teens and pre-teens will gobble up. Ross has created a vivid and imaginative world that I know people will find believable and realistic. A hundred or so years in the future, no one over the age of nineteen survives. Caused by a worldwide epidemic, by the time someone reaches the age of nineteen, they rapidly age in the space of a few weeks. This means that all knowledge before 2019 has disappeared and life has turned back to what it would have been like in medieval times. When Roxanne turns up at Della Tallis, the home of a group of tribal people, Cyrus, Navid and Taja’s lives are thrust into danger, for they are about to embark on a journey that could help the fate of millions of people. They are looking for their peoples past, and the cure. The Soterion Mission was told in a much unbiased viewpoint. Getting both the Constants- those tribes who follow the values of the people before them- and the Zeds- the brutal tribes who revel in other people’s pain- perspectives across really added something to the story line, and made it a lot easier to follow. There were a lot of very humorous parts in The Soterion Mission, including a hilarious use of the IKEA catalogue. Mixed with the many sober moments, this created a nice contrast. The ability to swap between the two was something that greatly impressed me, as this is very hard to do. The one thing that let me down with this book was the characterisation. Although I grew to like the characters, I didn’t become invested enough in them and felt that because of this their subsequent deaths had no impact on me. Yes, I liked Cyrus, Roxanne and the rest of them, but did I really care what happened to them? Not as much as I would have liked. The Soterion Mission wasn't a bad read. I can see a lot of readers devouring this short novel, with its grittiness. And I can also see a lot of readers who wouldn't like this novel at all. It's not that there were any problems with The Soterion Mission, it's just that some parts weren't for me. And I think that's what will decide whether a person enjoys it. 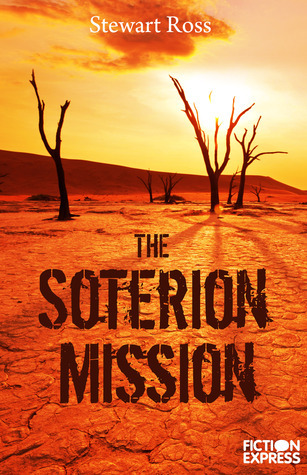 There's no denying The Soterion Mission is a great novel, it just won't suit certain people. Overall, I really enjoyed it, and can't wait for the sequel! I want to start off by saying that this is one of the most different, realtor dystopians I've read. Although it's set in the future, there was an old-style Medieval feel to it, because society has collapsed and all knowledge has been lost. I just want to point out what a great concept the story is. And although it's not magnificently original, it's definitely something different. When I first heard of this book and read the tag line ("Think you'd like to live in a world without adults? Think again.") it reminded me of the Gone series by Michael Grant, but let me tell you this is nothing like that. It's much more real, and there's no paranormal aspect to it. It's not as gruesome, but I must say there is some gory scenes involving the evil and sadistic Zeds. So I was a bit surprised when I started reading The Soterion Mission, because it wasn't what I expected, but it was pretty good. "I've named this vault after an ancient word for salvation: Soterion, the only place of hope in a world looking so desolate that it breaks my dying heart." At the beginning, the story started off slow and it was a bit boring. Bit soon after, the story picked up pace and I really got into it. The Soterion Mission is a definitely a book for older YA readers. I think they'd understand it and enjoy it better than younger readers. And it also has a good bit of gruesome gore, so I don't think the younger ones would enjoy that either! The journey these kids set off upon was brilliant! Not only did the action and suspense remain throughout, but the characters learned more about themselves and each other which gave off a lovely coming of age scent. The plot was thrilling, and I couldn't put it down whenI was halfway through. The story was unpredictable and I was rooting for the characters! A great, great story that I'd read again. The characters are definitely the best aspect of this novel. They're developed so brilliantly, and I loved each one of them, even the bad guys! Roxy and Taja were my favourites, I admit. Each personality was distinct and there reactions and relationships were realistic and relatable. *SPOILER ALERT* One thing that I disliked was how nearly every one of them died at the end. It was extremely disappointing, and I felt they all developed their relationships and got to learn more about themselves and each other for nothing. I REALLY really wish they hadn't all died, because then this review probably would have been a 5 star one. That's how upset I was. *END OF SPOILER* Overall, there was a brilliant set of characters, which I loved, and I think everyone else would too. "There's only one word, Roxy. SOTERION." I'm not really sure I liked the writing in The Soterion Mission. It was very boring and made the story less of a page turner. When switching perspectives, the author used the "Meanwhile..." way, which I thought didn't work for this typos of story and made the writing look very shabby. I just thought the writing didn't suit the thrilling story, didn't live up to it. A bit disappointing since I always look for interesting writing that suits the story in a book. Stewart Ross is a great author, there's no denying that, it's just the style of writing used in The Soterion Mission wasn't right for the story, and didn't live up to it. I received a free copy of this book from the publisher in exchange for an honest review. This does not affect my review/views in any way. Thank you Curious Fox! I honestly don't want to write this review; because this is most definitely a Marmite book. I remember my friend Jack saying something about seeing people loving or hating it, and I have to say I hated it. And I really, desperately wanted to like it! I'm going to pick up on the negatives first and the positives after, so I can hopefully pick you up a little bit. My main problem with it was the complete lack of character development throughout the book. It just jumps straight in without a proper introduction, and throughout the book so many characters just come in and aren't fully introduced, no more than their names. Maybe this wouldn't bother some people; but I'm a very character-driven person. As a result of this, the little romance is this book felt rushed and didn't have much impact on me. Another thing was the fact that for a lot of it, there was an excess of action. Though the action scenes were well executed, there were too many of them. You may say that, yes, it is an action book; but even in action books there is a balance, and to me, this book just didn't have it. Because of this, it was quite dragging, too. After 90 pages or so, it got better for a while; and I enjoyed this segment of the book. However, I love the action scenes and slight gory aspect to this book! The prologue is mysterious, and that does continue throughout the rest of the book. Some of it is descriptive, and I enjoyed those parts; as well as the parts where we could see the characters' thoughts. Oh, and, I adored the links to the non-dystopic world. The frequent references to an IKEA catalogue and similar items besides made me giggle throughout the book. I would say that this book is a little more gory than I'd usually go for, but the easy-going style kept me reading. This is a quick book to read with its short length and fast-paced action, so I was able to kind of gloss over the gore in my head. And there are some very humoro 5 Words: Hope, life, death, knowledge, power. What is this book? Have I ever read anything WORSE ? I read this book for the Book Club I belong to. I wasn't expecting enormously great things, but I wasn't expecting THIS either. OK, let's start with the characters. The flat, boring, cliché What is this book? Have I ever read anything WORSE ? I read this book for the Book Club I belong to. I wasn't expecting enormously great things, but I wasn't expecting THIS either. OK, let's start with the characters. The flat, boring, clichéd pieces of cardboard characters. They literally had no personality whatsoever - I felt like each one was the same person with a different name. They were so predictable, so 'good', and GAH. They were not good characters. (also I kept getting mixed up with Cyrus and the dog, Corby, because they had similar names.) And the 'zeds' - I cringed every time I read about them. They acted like babies, not savages. But the worst thing of all was the writing. It consists of a lot of telling, and not showing. It feels so unprofessional and juvenile. It feels like the author is writing for really young kids, when this book is definitely for people who are young adults or teens due to the theme and content. It was just awful. And it was so bad at depicting characters or world building. Or anything. Set a hundred years in the future, an epidemic has caused all adults to die, and everyone since to die in their nineteenth year. This promised to be a very original and thought-provoking dystopian, and while I did enjoy it, I think it could have been much better. The story was quick to start with the drama, but it was incredibly confusing at first. I couldn't quite grasp why there were these two groups, almost religious sects or something... but now that I think about it, they do represent the tw Set a hundred years in the future, an epidemic has caused all adults to die, and everyone since to die in their nineteenth year. This promised to be a very original and thought-provoking dystopian, and while I did enjoy it, I think it could have been much better. The story was quick to start with the drama, but it was incredibly confusing at first. I couldn't quite grasp why there were these two groups, almost religious sects or something... but now that I think about it, they do represent the two ways that society can turn after an apocalypse: try to recreate the ways of the past or break down into murderous thugs. But my point is that it was all simplified, yes, but not explained how these groups had come into being after the Great Death. I would have liked some technical world-building and explanations, but that's just me. It was set in the future, but because of the break down of society, it felt like the 1600's, with the lack of knowledge about technology and suspicion about strangers, which made for some very interesting situations and unique problems that nowadays could be easily solved. And because of this inability to pass on knowledge, books were rare and the ability to read was valuable. Luckily, the community Roxanne comes from has three books, on which they had based all their theories of the Long Dead. This made for some very funny in contrast to the drama of the end of the world, especially trying to make sense of Peter Pan! Now, speaking of Roxanne, I had my moments of dislike. There was some superficial development in most of the characters but I think the thing that really annoyed me was the instant attraction between Cyrus and Roxanne. It seemed forced and I'm really pleased that it didn't become the main focus of the story. What appeared to be an ordinary mild flu has changed the genetic code of humans so that they now live no longer than 18 years. In the last month of their life they age rapidly, and they all know when this will happen. Society has broken down and is divided into the Savage Zeds and the more peaceful Constants. The story begins with the pursuit of a young woman by hunting dogs and savage Zeds. She manages to reach a Constant community and persuades some of them to help her on her Mission – to find What appeared to be an ordinary mild flu has changed the genetic code of humans so that they now live no longer than 18 years. In the last month of their life they age rapidly, and they all know when this will happen. Society has broken down and is divided into the Savage Zeds and the more peaceful Constants. The story begins with the pursuit of a young woman by hunting dogs and savage Zeds. She manages to reach a Constant community and persuades some of them to help her on her Mission – to find The Soterion, a body of knowledge left by the Long Dead which will not only help the future of the communities of Constants, but may also hold the secret of a cure allowing them to live beyond 18. This book totally absorbed me – I wanted to know whether the Soterion would be found, and whether the main characters would survive long enough to reach their goal. The first in a series I await the second part with interest. Mixed feelings about this book. I loved the fast-paced plot and the storyline was great, as was the description of the world of the Constants and Zeds - I could picture it easily. There were a few stand-out passages throughout the book that really caught my attention. One of my favourites was in chapter 9 when the Mission come across the entwined skeleton Long-Dead lovers; a beautifully written passage. I also enjoyed the slight touches of humour, such as the inclusion of the Ikea catalogue as one Mixed feelings about this book. There were a few stand-out passages throughout the book that really caught my attention. One of my favourites was in chapter 9 when the Mission come across the entwined skeleton Long-Dead lovers; a beautifully written passage. I also enjoyed the slight touches of humour, such as the inclusion of the Ikea catalogue as one of the three books of Yonne. Much improved after the on-line version was skilfully edited by Curious Fox. I believe Roxanne is one of the most interesting characters I have created and I'm pleased with the way the plot hangs together. More importantly, the book examines serious issues regarding the frontier between childhood and adulthood: where does it lie and how and why does it vary between cultures and over time? Stewart Ross has written more than 300 titles, fiction and non-fiction, for children and adults. Many are about (or inspired by) history. He lives near Canterbury, England.